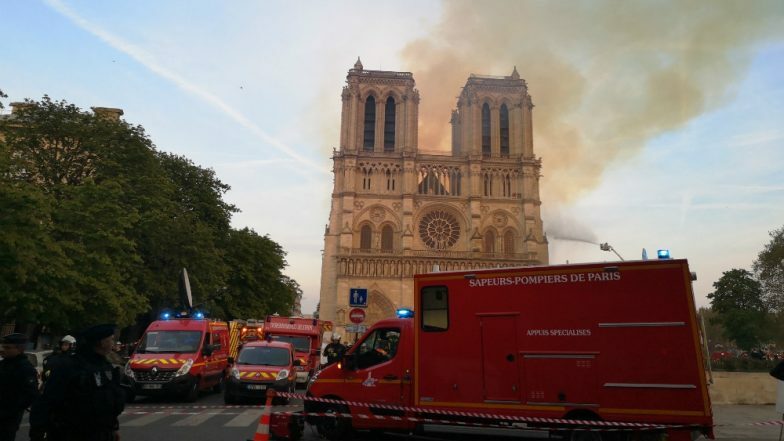 Paris, April 16: A major fire has engulfed the medieval Cathedral of Notre-Dame in Paris, one of France's most famous landmarks. The 850-year-old Gothic building's spire and roof have collapsed but the main structure, including the two bell towers, has been saved, the BBC reported on Tuesday citing officials. Firefighters are still working to contain the blaze as teams are trying to salvage the artwork stored inside. President Emmanuel Macron called it a "terrible tragedy". The cause of the fire is not yet clear. Notre-Dame Cathedral in France Engulfed in Flames, Fire Fighting Operation Underway; Donald Trump Reacts. The Paris prosecutor's office said it has opened an inquiry into "accidental destruction by fire". Visiting the scene, Macron said the "worst had been avoided" and that an international fundraising scheme to rebuild the cathedral would be launched. Firefighters worked for hours to prevent one of the main bell towers from collapsing. But the main structure had been "saved and preserved" from total destruction, Paris fire chief Jean-Claude Gallet said. Thousands of people gathered in the streets around the cathedral, observing the flames in silence. Some could be seen openly weeping, while others sang hymns or said prayers. Several churches around Paris rang their bells in response to the blaze.